Polish clarinetist and composer Wacław Zimpel is known as the leader of ensembles such as Hera, Undivided, and his namesake quartet, as well as for his membership in groups like Mikołaj Trzaska’s Ircha Clarinet Quartet and Ken Vandermark’s Resonance Ensemble. His latest venture is the To Tu Orchestra, a uniquely-rostered nine piece band that makes its debut with Nature Moves. 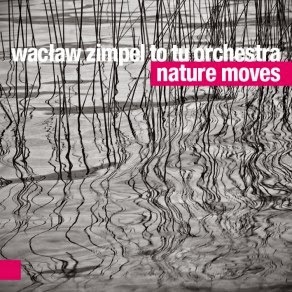 In addition to Zimpel’s clarinets, the Warsaw-based ensemble features a variety of saxophones and recorders, hurdy-gurdy, piano, two bassists, and two percussionists. The foundation of Nature Moves is a loose grouping of “repetitive” musics—everything from Javanese gamelan to Terry Riley to ritual world music serves as an influence. Opening piece “Cycles” begins in a delicate Eastern mode. The song progresses in a fashion similar to Riley’s In C, where canonical rhythmic patterns gradually shift, with new patterns constantly emerging as elements are added and subtracted. This slow arithmetic becomes increasingly intricate and hypnotic—“Cycles” feels about half of its 28 minute length. In the last ten minutes, the piece really opens up, with the improvised counterpoint of the horns beginning to overwhelm the grounding, repetitive patterns. The other pieces are of a similar mindset, though not all are in such rhythmic lock-step. “Nature Moves: River” advances in slow throbs until reaching a sudden crescendo of jagged piano chords and wailing horns. It’s the least authentic moment of the album—the intensity feels uninvited and misplaced—but it’s short lived, coming to an abrupt halt and opening up space for an incredibly emotional and intense recorder solo by Dominik Strycharski. Later movements find the band spinning through a harmonic prism, projecting new hues by alternating tempos and beat-emphasis around big, chiming piano chords. mastery of timbre. Nine musicians is nothing to sneeze at, but at their best they sound even larger, and are often blended into a tonal wash that defies categorization. The warm drone that underlies the opening of “North: Where the Prairie Meets the Mountains” is a mixture of no less than four instruments, though the exact contribution of any particular one is maddeningly hard to tease out. Likewise, the final moments of “Nature Moves: Under Surface” have a shimmering quality that sounds like the most sophisticated electronic ambient music. Making your way through the album, what reads like a quirky, eclectic mix of instruments on paper begins to coalesce as genius: like the great Henry Threadgill, Zimpel’s grasp of unique timbral combinations results in profound, peerless music. The coda of the final piece conjures the intensely spiritual jazz John Coltrane made just before his death, along with the Eastern and world music influences his wife and acolytes would bring into their own music. As the song reaches its zenith, it’s heartening to hear the same influences that fueled the creativity of Coltrane’s circle 50 years earlier reenergized and renewed through Zimpel’s efforts. It's a breathtaking closing to a unique album. To be sure, it’s a bit of a shock when it all ends in silence: it feels like such a cathartic, concert-going moment that you fully expect a burst of applause—or, at the very least, the sharp exhalation of a tightly-held breath.